You must first sign in or register. If you submitted to a challenge before signing in was required, then an account has been created for you. If that is the case, please click here to retrieve your username and temporary password - use the email address you entered when you submitted your previous entry(ies). Once it arrives by email, sign in, and then click on themy paintworkslink, which appears upon sign in, at the top of each page to change your username, if you like, and your password to something more memorable. Once you sign in, go to the challenge you want to participate in and you will see a Submit to the Challenge! link to the right of the challenge image. Click the link and simply fill out the dialog form that appears. After a quick spam screening, your submission will be posted on this page and available for other artists and potential buyers to see. Best of all, you don't have to sign up for anything and there are no fees or commissions. 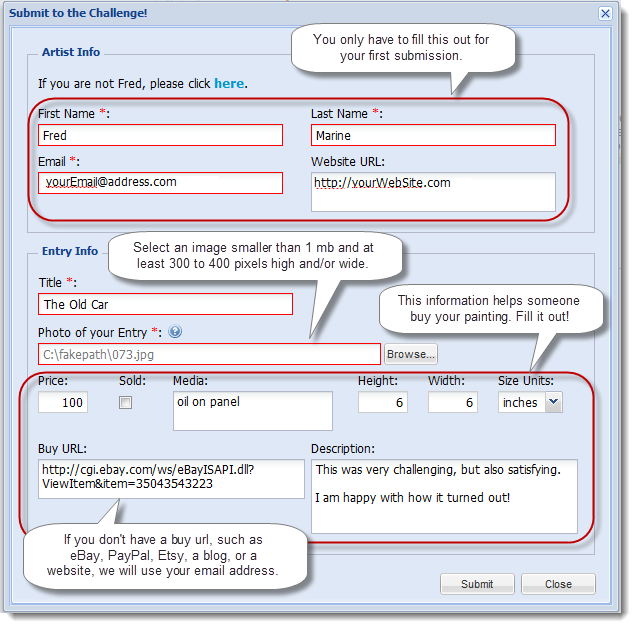 Note: this dialog has additional auction fields for the Help Japan Challenge. Posted - Sat, Apr 2, 2011 at 5:31 PM. This article has been viewed 4654 times.